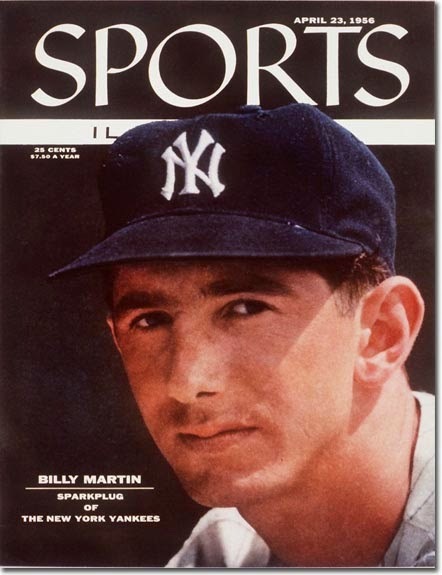 Paying tribute Billy Martin on the 25th anniversary of his tragic death on Christmas Day in 1989, much has been written about Martin’s fiery nature as a manager, especially his many run-ins with the late George Steinbrenner. The persona that Martin exhibited as a manager, very closely reflected the energized spirit that willed him to success as a young ballplayer. Back in 2008, I had the opportunity to speak with Gene Valla, Martin’s teammate in the Yankees minor league system. Valla was three years older than Martin, but they both grew up in the San Francisco area, with Valla attending San Francisco Polytechnic and Martin attending Berkeley. In 1950, the Bay Area natives reunited while playing for the Yankees Triple-A affiliate in Kansas City. Martin was sent down from the big league club for more experience a month into the season. During their time playing together, Valla described Martin as having a penchant for victory despite his ordinary appearance on the field.